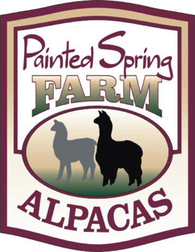 Thank you Russ and Brenda Wyler of Crossed Arrows Alpacas located in Velma, Oklahoma for purchasing 1/2 interest in Alpaca Palace's Houdini! We are excited about our new partnership! Houdini will be settling females in Oklahoma leaving PA in October returning in April to Butler, PA. This girl is the type of alpaca you dream of when you plan a breeding. We bred our Hemingway line girl with the amazing Raspberry Hills White Russian (Grand Alero / Grand Master) and were rewarded with Petra. We can't find a thing wrong with her conformation and the fleece - well that needs to be seen! She can move your breeding program to the next level. Add all that to her sweet demure personality, she's could be the best thing to come to your farm. We purchased this Houdini breeding several years ago, but a few attempts didn't work out, so we took one of our favorite producers, Petra out for the breeding. Once and done, Petra came home pregnant and had a completely problem free pregnancy - and delivery. We knew this one would be white, or would have been surprised if he wasn't! What surprised us on the day we tipped him was the huge extra folds of skin on his neck and shoulder area. This boy is going to be DENSE! He is built like a little Sherman Tank. 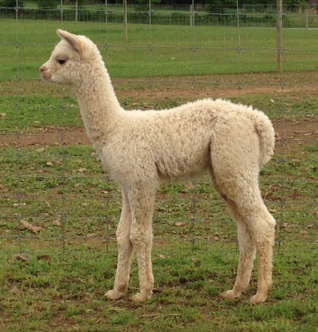 Standing shorter than the other crias born at the same time, this guy has at least 20 or more pounds on them! He stands solid as a rock. Each time his Juvie fleece was shown in 2016, it did better than the last ending the season with 2 firsts and a championship. He also won 2 youth championships in 2016 at PAOBA and MAPACA. 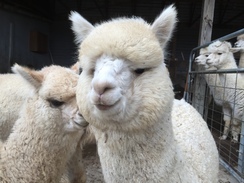 He was selected to represent the alpaca industry in PA at the 2017 PA Farm Show where he and his youth handler met Governor Wolf! Mike should be ready to start breeding in the spring of '17. Be one of the first to get in line for this amazing boy.